According to the New York Times, the word God was used a total of 57 times during the recent Republican and Democratic National Conventions. Just for fun, let's imagine if the word Goddess were used instead. Would the switch of one word in a very public arena change contemporary women's views of themselves and their relationship to power? I believe it would. As the author Carol Christ wrote in her widely reprinted 1979 essay Why Women Need the Goddess: "Religious symbol systems focused around exclusively male images of divinity create the impression that female power can never be fully legitimate." Without imagery and words that reflects our female experience of the Divine, how can contemporary women see themselves in all their diversity, complexity and most powerful selves? "Shakti represents fierce, creative energy, the energy that I had to call upon... when I had to fight the system to get my son the services he needed after he was diagnosed with autism." "I have never accepted any constraints put upon me as a woman. Perhaps that is why I am drawn to the Goddess... Adjoined to her husband Shiva, in their half-man, half woman form, she is fully capable of co-ruling the world". Speaking of co-ruling the world, Pat Mitchell, President and CEO of the Paley Center for Media, pointed out in her blog "Where are all the Leaders for Women, Not Just Women Leaders?" that the U.S. ranks 69th amongst countries with the highest percentage of women in government. 69th! Behind such countries as Andorra, Rwanda, and Cuba?! Watching the current presidential campaign, and the unbroken lineage of male presidents who have dominated our politics since America's inception, I'm feeling a serious need for more Durga, more Shakti. Perhaps it is possible, as Carol Christ also wrote, that "as women struggle to create a new culture in which women's power, bodies, will, and bonds are celebrated, it is natural that the Goddess would reemerge as symbol of the newfound beauty, strength, and power of women." So indulge me, please, in my fantasy: at a not so distant future presidential convention, amongst the usual hullabaloo -- bright lights, throngs of waving posters and eager faces -- a new speaker takes the stage. During the soaring oration detailing the state of the economy, the plight of the middle class and the role of government, I hear the speaker say it: very simply, the word "Goddess". In the moment that follows, as the profundity of that word sinks in, women -- and men! -- will be electrified with a transformed vision of women's powerful capabilities, innate strengths and formidable empowerment. Now I'm really excited about our political future! Goddess bless America! 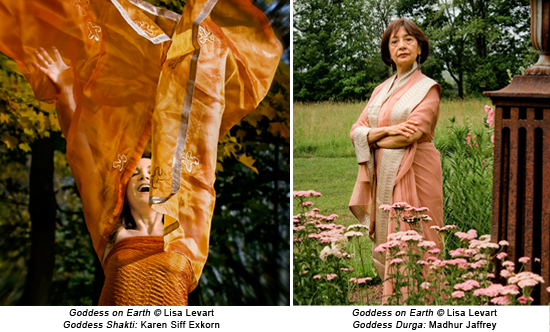 "Goddess on Earth" is available at: www.goddessonearth.com or join the Goddess on Earth community on Facebook.